When the booker starts a booking on your public page their space on the event is temporarily reserved until they either complete the booking or the checkout reservation period has passed. This prevents the space from becoming double booked before the original customer has completed their transaction. 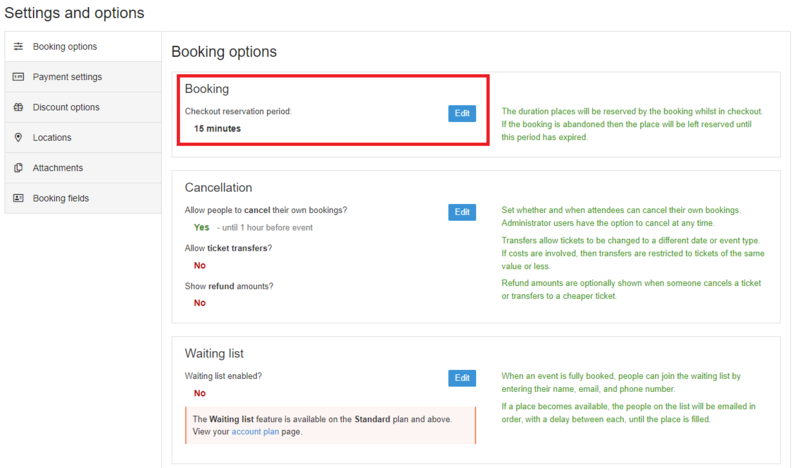 The checkout reservation period can be set from your booking options page. By default, it is set to 15 minutes - to adjust this simply click on the edit button. For example - if your checkout reservation period is set to '15 minutes' the booker has 15 minutes from clicking the 'Book now' button (highlighted below). If they don't complete the booking then the space will become available for others to book again. If your event only has one space remaining and someone enters the checkout reservation period then it may appear to be 'sold out' on your schedule page, even though you can see 1 space still remaining. This will be resolved as soon as either the booker completes the booking or the checkout reservation period passes. You may wish to navigate to your Bookings tab and search with the checkout filter enabled to view the booking in progress. If you are using the Waiting list feature you may experience a similar situation as the available space is reserved until all those on the Waiting list have been contacted.